Step 1 Finely chop the pecans, using a rocking motion with the knife. Set aside. Step 2 In the bowl of a stand mixer using the paddle attachment, or in a large mixing bowl using an electric mixer, beat together the shortening and sugars until combined. Step 3In a medium bowl, lightly beat together the eggs and vanilla. Step 4Add the egg mixture to the sugar-shortening mixture and beat thoroughly to combine. Step 5In a separate medium bowl, combine the flour, salt and baking soda, stirring to combine. Step 6Add the flour mixture to the egg-sugar mixture and stir until combined, then stir in the oats and pecans until incorporated. Step 7Divide the dough into fourths. Place each quarter on a sheet of waxed paper and roll into a log 1 1/2 inches in diameter, wrapping the waxed paper tightly around the log. Step 9When you're ready to bake the cookies, heat the oven to 350 degrees. Unwrap the dough from the waxed paper and slice into rounds approximately one-half-inch thick. If the dough is frozen, there is no need to thaw; just increase the baking time by 1 or 2 minutes. Step 1 0Place the rounds on a cookie sheet and bake until light golden brown, about 10 minutes. Using a spatula, remove the cookies from the sheet immediately. Cool the cookies on a rack. In Recipes-list.com we have selected the most viewed recipes from category - Desserts . Enjoy the best recipes specially selected for you! 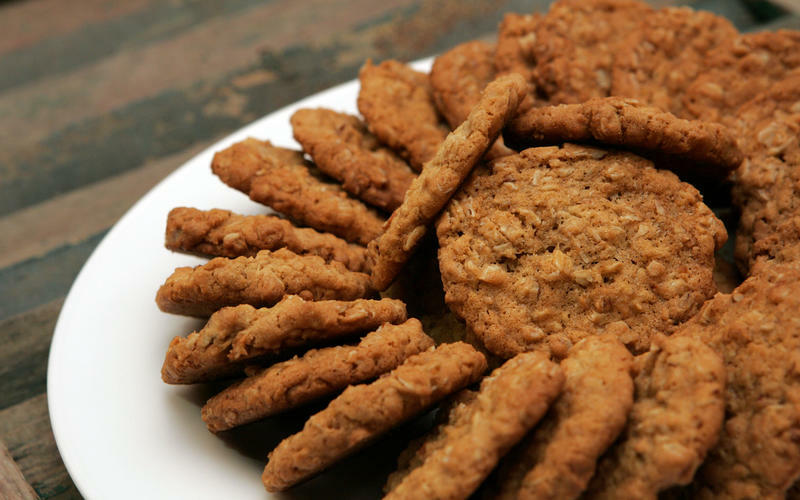 Oatmeal crispies is the right choice that will satisfy all your claims.